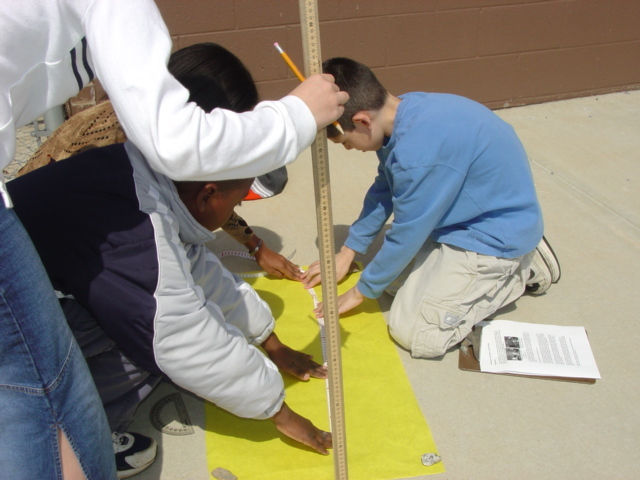 angle : 34.605Â° Hi, this is the 5th grade gifted class at Charles Brant Chesney Elementary. 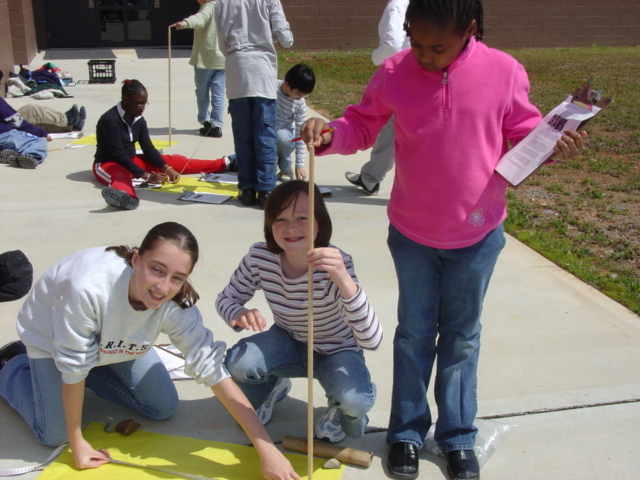 We got involved in this project after we read the book The Librarian Who Measured the Earth, by Kathryn Lasky, which really inspired us to conduct Eratosthenes experiment for determining the circumference of Earth ourselves. Then we heard about the Noon Day Project and our teacher signed us up. We collected the materials we would need whcih included meter sticks, protractors, tape measures, butcher paper, a plumb bob borrowed from one student’s uncle, and pencils. 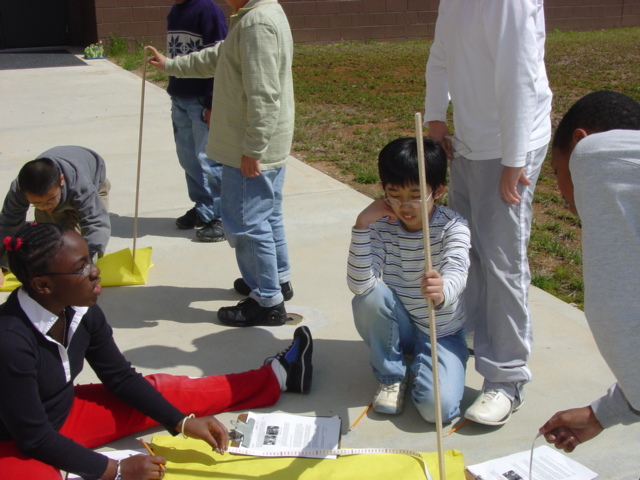 We decided we needed to first find out the latitiude and longitude of our city, Duluth, Georgia, so we used the Internet and discovered our latitude is 33.9775 N and longitude 84.14955 W. We discussed our experiment step-by-step and practiced using our materials and measuring angles in the classroom. We also talked about how the direct rays of the sun strike Earth and how objects on Earth cast shadows that create different angles depending on the location. 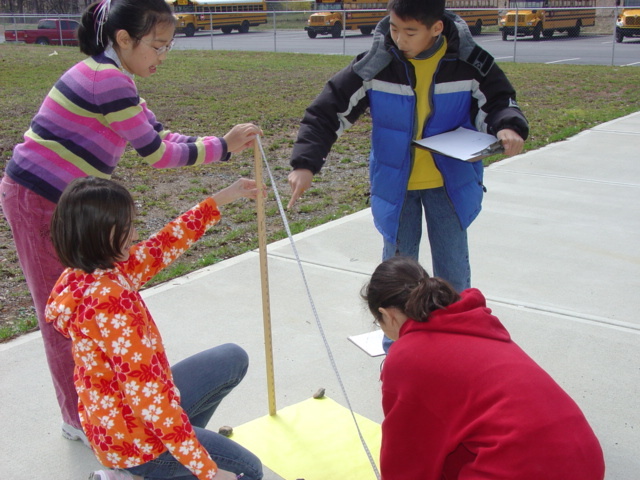 We figured out that using another meter stick to create the angle from the top of the meter stick to the ground was not going to work, because the meter stick wasn’t long enough, so we decided to use a measuring tape which was 150cm long to visually make the hypontenuse formed by the meter stick and the measuring tape. On Friday, March 18, we took our first measurements. One team decided to anchor their measuring device, the meter stick, with clay. Another team tried using an empty toilet paper roll filled with marbles to keep their meter stick vertical. 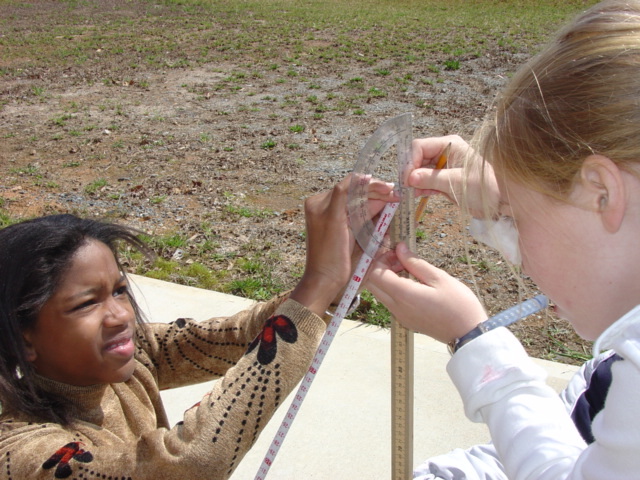 We researched the time of ’true noon’ in Duluth for March 18, which was 12:43 p.m. We went outside 30 minutes before true noon to begin taking measurements of the Sun’s angle. First we set up the butcher paper, which we were using to make sure we could see the shadow well,on the sidewalk behind our school. Since the wind was strong, we had to set rocks on the corners of the paper. Second we stood the meter stick up. Some teams just used one person to hold the stick steady, but it was not an easy task. We shared the plumb bob to check that our meter sticks were at true vertical. The Sun cast a good shadow as we tried to take measurements every two minutes. We continued for 30 minutes after true noon. Our teams had slightly different measurements. The weather that next week was rainy, cloudy and stormy. We were worried that we would not get a second chance to measure the Sun’s angle, but Wednesday the weather finally cleared. 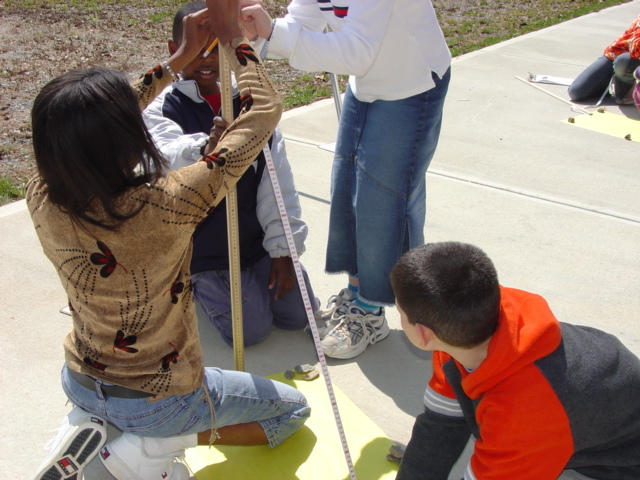 We invited our parents to come to school on Thursday, March 24 to help us make a second set of measurements. It was a clear, sunny day with less wind. They were a big help, because we needed an extra person on each team to help hold the meter stick or to make sure we were making accurate measurements. Our teams’ measurements were closer to each other the second day. Our Sun’s angle measurements averaged 34.605 degress. We chose Sekolah Alam School in Jakarta Indonesia for our partner city. We were excited that they had chosen us. We wanted to see how close our two results would be. The sun’s angle at Jakarta was 7.970 degrees. Now that we had the angle of both cities, we would have to find the distance between Jakarta and Duluth in miles, kilometers and we also found the difference in degrees of Latitude between our cities by adding the degrees of Latitude from Duluth to the Equator, 33.9775 and 6.1333 which was 40.1108. When we used the formula for finding circumference,using the distance in miles and kilometers between our two cities, we came up with answers that did not seem accurate. We had trouble using the trigonometry formula. Our teacher did some research and then shared with our class a piece of information that makes the whole process of finding the circumference so much easier. She told us that every single degree on Earth has about the value of 111 miles. When we subtracted Jakarta’s sun angle from our sun angle, it was about 28 degrees. We multiplied 28 by 111 which was which was 3,108 miles. After that, as a circle is made up of 360 degrees, and the circumference of Earth is a circle, we divided 360 by 28. The quotient was 12.85 rounded to the nearest hundredth. Twelve and eighty-five hundredths is how many sections of 3,108 miles that make up the total distance around Earth. We multiplied 3,108 by 12.85 to get the circumference 39,937.8 miles. This made us cheer, because we felt this was more accurate than any of our other measurements. We tried using the Sun’s angle measurement from Conners Emerson School in Bar Harbor Maine also, but we think our results weren’t accurate, because we took measurements on different days. Next year, we will take arrange to take measurements on the same day as our partner cities. We think everyone should know the number of miles (111) in a degree of latitiude, because it was a lot easier to calculate the circumference of Earth without this information. The whole experience was fun and we learned a lot.